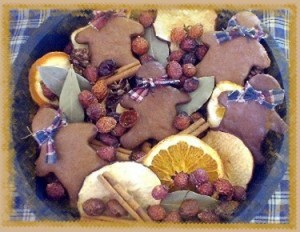 If you like placing potpourri around your home or office and are looking for something that smells scrumptious and has Gingerbread in the mix, you might want to try this Gingerbread Cottage Mix which includes 7 Dipped Gingerbread men Nestled in Dried Orange Slices, Apple Slices, Prim. Rosehips, Cinnamon Stix & more. All Heavily scented in “Sweet Warm Gingerbread” oil, at least 5 heaping cups. Details here.